The Qualcomm Snapdragon 636-powered Nokia 7.1 has been around for only a few weeks, but it arrived with Android Oreo onboard. Now, this Android One device is already receiving the Android Pie treatment as promised, and the units located in all regions of the world should get the new software in a few days. Available in the US via multiple retailers, including Amazon and Best Buy, the new Nokia 7.1 has only been around since last month. Unfortunately, this handset was released into the wild with Android 8.1 Oreo onboard. On the other hand, the Android Pie update for it has been introduced yesterday, so everything should be just great for the owners of this Android One device. 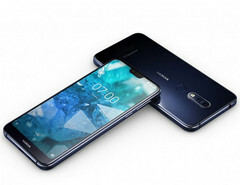 Those who missed the Nokia 7.1 so far and are looking for a good mid-ranger might want to take a closer look at this handset: Qualcomm Snapdragon 636 processor, 3 or 4 GB of memory, 32 or 64 GB of internal storage and microSD support, a 5.84-inch display with a notch and full HD+ resolution, a rather modest 8 MP selfie shooter, a 12 + 5 MP main camera setup, and a 3,060 mAh battery to power them all. Since we are talking about an Android One handset, the goodies delivered by the stock Android Pie firmware should all be included in the update: Adaptive Battery, improved notifications, Digital Wellbeing, enhanced navigation, and much more. If you are a Nokia 7.1 owner who already got the update, feel free to share your thoughts about it with the rest of us in the comments section.